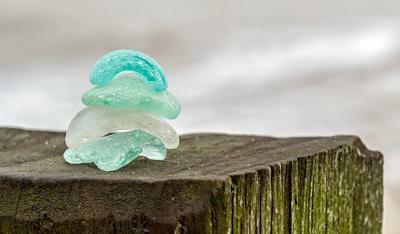 I have been collecting sea glass for just a few months now but am already addicted to it! My local beach is at Gorleston on Sea, Norfolk on the east coast of the UK. We don't have masses and my best haul was 13 pieces in about an hour - some of them very small. We tend to only get green and white but I am thinking the top piece in my shot might be a turquoise - or similar? End of October 2015 on a beautiful autumn day with some sunshine. The tide was low. Absolute excitement - I loved the colour, the shape and the size of all these pieces. I have a Nikon D3100 and the lens was my 55 - 300mm. Look for them in shingle and if you have old wooden groynes then around the posts.